Sim City 2k, Post-Capitalism, and ‘The Four Futures’. Following the excellent Kevin T. Baker essay on the inherent ideology of the Sim City games and their effects on how people think about urban planning, I got to thinking about the Arcologies in Sim City 2000. 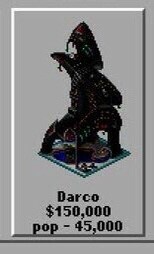 The Arcologies are the end point of the game, the only real winning condition the series sets up. If your city is successful enough to build new forms of cities, then you win. Which got me thinking about the end of capitalism. Peter Frase’s “The Four Futures: Life After Capitalism” states that capitalism as we know it is coming to an end, not only due to the productive limits of industry and rate of value added, but also the ecological limits imposed by climate change. You see this in equity funds stripping the value out of established industries and moving on, vulture-like, pushing the stolen value up the ladder. You see it in the increased commodification (things you sell) of everyday life, from sleep apps to socializing to getting around. They have a pretty cool trick to make wages so low and turn things you need (like housing) into commodities so you work endlessly to afford them so you have to use a cheap taxi or cleaning service which exploits the workers below you AND sells all your data use to advertising companies. Capitalist enclosure is complete, but unsustainable. The problem with capitalism is you eventually run out of people to exploit. Peter Frase creates an grid of four broad possible futures this post-capitalism will take: abundance/scarcity egalitarianism/hierarchy. His summary of it is here and worth a read, but I’m going to simply it further. 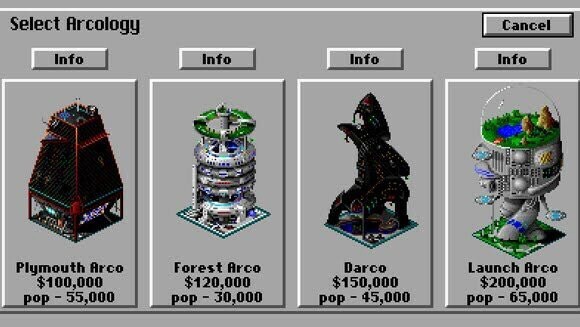 Which Four Future Corresdonds To Which Sim City 2k Arcology? Egalitarianism and Abundance: Fully Automated Luxury Gay Communism. Everyone is equal cause everyone has access to the means of production, technology has sorted everything out, direct class conflict between labor and capital is over, and all labor is voluntary. Star Trek, basically. Hierarchy and Abundance: Rentism. Endless abundance is possible, but restricted. The cyperpunk dystopia model of intellectual property being expanded to include everything. The Silicon Valley vampire’s favorite future where we all work for exposure, huge debts, and with a gigantic servant class for the handful of property right owners. Possibly very unstable. Egalitarianism and Scarcity: Socialism, but make it democratic. Scarcity exists, from physical limits on consumption or climate change, maybe you only have so many energy points a week? A planned market with everyone’s involvement arranged for the greater good. But since everyone’s needs are taken care of and they can work in a “capitalism of consenting adults”, a limited free market exists and status or skill (as say a musician or as an organizer) replaces class. Hierarchy and Scarcity: Exterminism. Neo-Feudal hellscape, baby! The rich decide to hoard everything and let everyone else die, maintaing as few loyal retainers as they need. A world of gated communities surrounded by refugee camps and shoot to kill drones. Distressingly plausible as this is the future most of the super rich today are preparing for. Thanks to @holly on twitter for the inspiration and this episode of The Antifada for reminding me of it.